HSE Contractors is a group of building managers, engineers, schedulers, and claim consultants with a variety of experience, from estimating and preparing bids to construction. In addition to being an award-winning building company, they are also one of the fastest-growing scheduling and project management corporations in the U.S. While HSE Contractors is the leader in their industry, their online presence did not build trust or confidence with their target audience. As their business grew, HSE knew their website content had to grow with them and they needed to be found in search engines to drive qualified traffic. Scale your business to success with professional website content. HSE Contractors is an industry-leading consulting firm that works on major construction projects across the U.S. This means that their audience is highly technical, and they serve a highly niche market. 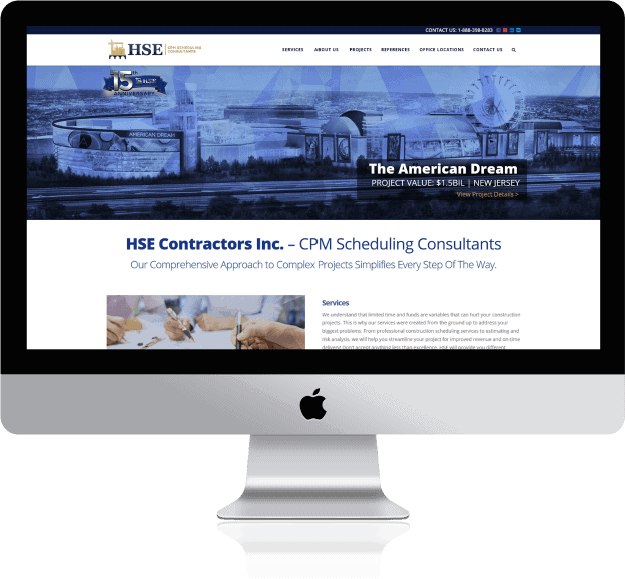 Unlike many other industries, HSE Contractors needed technical website content that would be educational and help drive sales. CPM Scheduling is a vital part to ensure that a construction project finishes on time and within budget. HSE Contractors is a leading consulting group that offers expert oversight to construction projects of all sizes. Since this service is part of a small niche in a competitive industry, we knew that we had to create website content that was technical yet approachable for construction managers and construction developers. As we worked in the main project that was lead by Pixelchefs, we continually developed engaging content that entertains and drives conversions. Our approach ensured the overall feel of the website matched the needs of their audience. We also worked on the design strategy to ensure each page of the site was designed to support the type of content and layout while also adhering to proven search engine marketing strategies. The result of our insight allowed us to produce highly optimized website content. We developed each page with a focus on getting their consulting services found on search engines, while also matching the tone and page structure. Our knowledge provided the guidance HSE Contractors needed to ensure that their online presence reached the same level of professionalism as their services offered to their customers. Many website content writers can produce content for consumer-facing businesses, but it takes an expert copywriter to craft content for niche industries like construction CPM Scheduling. 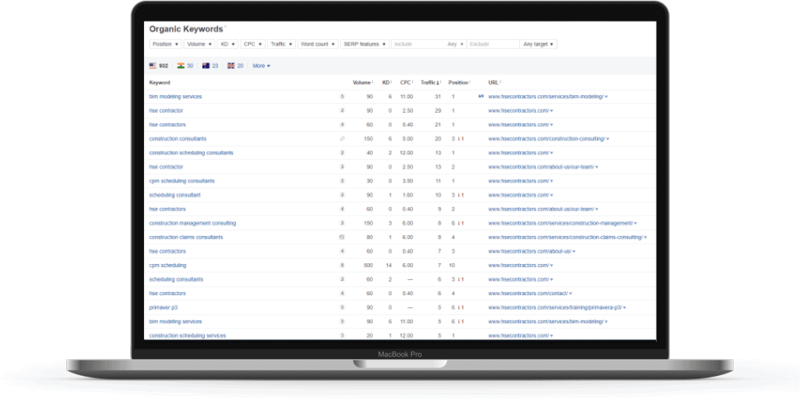 This is where our years of experience produced results for HSE Contractors because we were able to use customer research to find ways to craft compelling content that spoke to customers while also getting found on Google. Since HSE Contractors works with several markets and they have several services, we used in-depth market research to define each user persona and develop detailed content around each of their user groups. This approach not only helped keep the entire project efficient, but the research also supported efforts to target specific users throughout their website. HSE was struggling to get found for many keywords because their industry is very competitive. 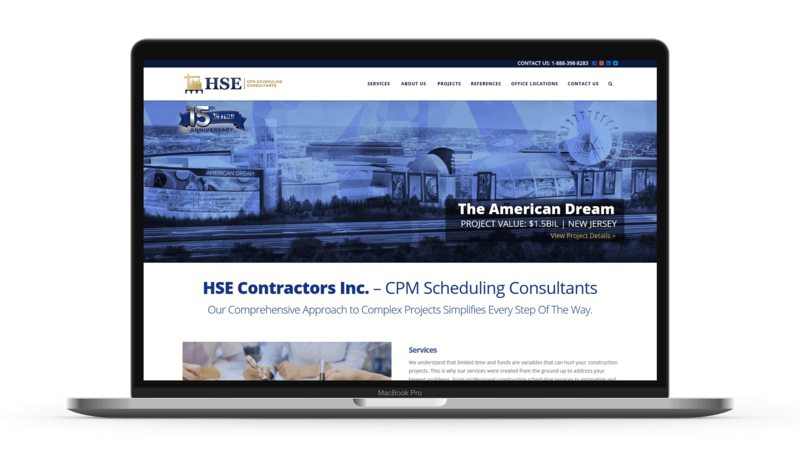 Since many of their clients worked on projects ranging into the billions of dollars, HSE Contractors had to have a website that ranked in search engines based on what their customers searched for. We developed a plan, and crafted expert content focused on the needs of their customers but optimized for search engines. Like many companies, HSE was feeling the pinch of a growing competitive landscape and higher operating costs. While they knew their services were the best in their industry, they needed a way to get found by potential customers while also decreasing the cost to acquire each lead. Our professional freelance copywriting services were the perfect answer to HSE Contractors because they saw a boost in organic traffic and conversions. By collaborating with the expert website designers at Pixelchefs on the project, we were able to deliver hand-crafted content that was customized to the business goals and needs of HSE Contractors. Not only did this mean that the content we provided engaged and educated their readers, but it also means that HSE Contractors saw a dramatic increase in their online ranking and sales. Our team is ready to partner with your team no matter the industry, market, or business goals. Talk to us today!